2014 is nearly over and everywhere people celebrate the new year with rockets and fireworks. To acclaim the new year I want to show you a special. 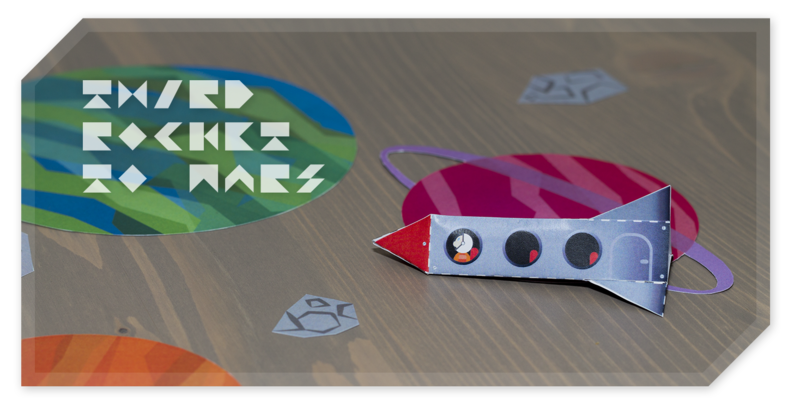 This time I worked out a whole papercraft game: Third Rocket To Mars. 1) When you have everything cut out and glued together, you spread the planets and asteroids all over the table. 3) Every game participant now has three tries to reach one ore more planets with the rockets. Therefore you flip a rocket with your finger from the ramp towards the planets. But try to avoid the asteroids or your spaceship gets broken. 4) If a rocket lands on a planet you get 5 points. If a rocket lands on an asteroid it gets broken and you loose 2 points. 5) Play as many rounds as you like. The one who has the most points at the end wins.